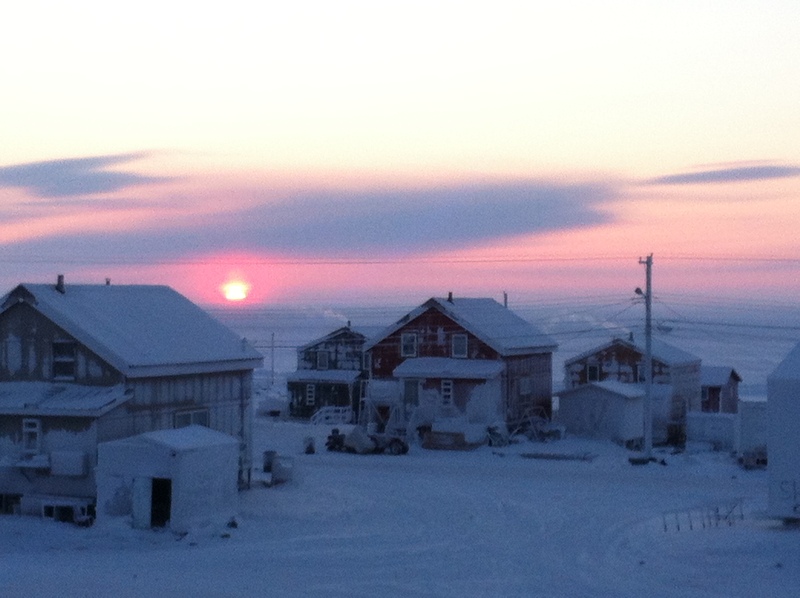 I had the good fortune to return to Gjoa Haven last month. 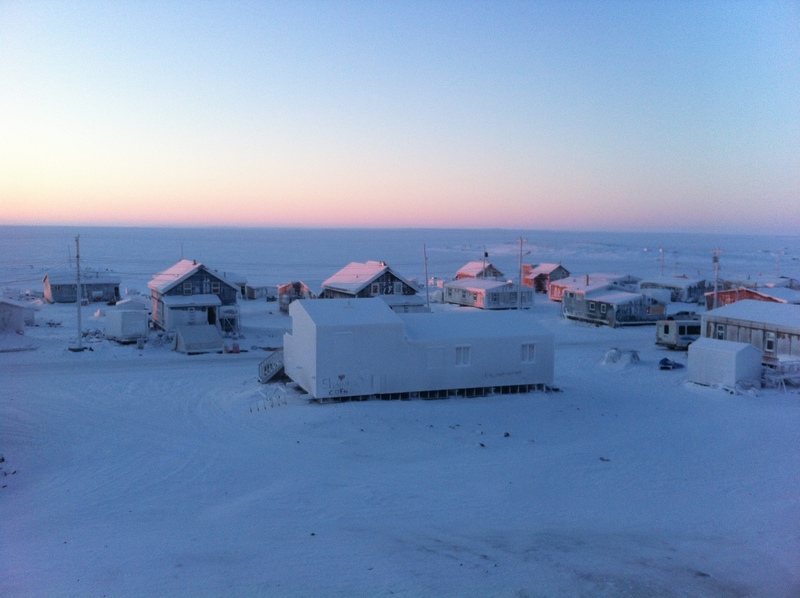 As you may recall from my previous blog post, I am now providing medical care to this remote Inuit community from time to time. I was last there during a heat wave in August, so I was looking forward to seeing what it might be like in November. As expected, it was dark and very cold. And very interesting. There were only about 2 hours of daylight when I was there, although we lost about 30 minutes a day over my few short days there. The sun rose around 10 am, and set around noon. It didn’t even really completely rise over the horizon – it just popped up and went down again, and didn’t seem to travel any distance at all. Its like being in a time warp. Sunset. Sunrise looks just the same. It was strange to have such dark evenings. Between the cold weather and the darkness, it was hard to be outside after work. I felt like going to bed after dinner. With nothing to do inside but watch television, I can see that the winter would be extremely long. There doesn’t seem to be anything to do in town either. Not much going on in the way of community gatherings. It seems folks just spend the winter indoors. I don’t think I could do it. I’d surely get cabin fever, if not depressed and seriously overweight and practically comatose. And if you consider the housing situation, which is that there are usually several generations, and probably a dozen people, living together in the small houses, (which look to be about 800 square feet) I’m sure people occasionally find that hard. At least I, as an introvert, would. However I think this is probably very traditional, many generations together in a small space, so perhaps for the locals it is not difficult. 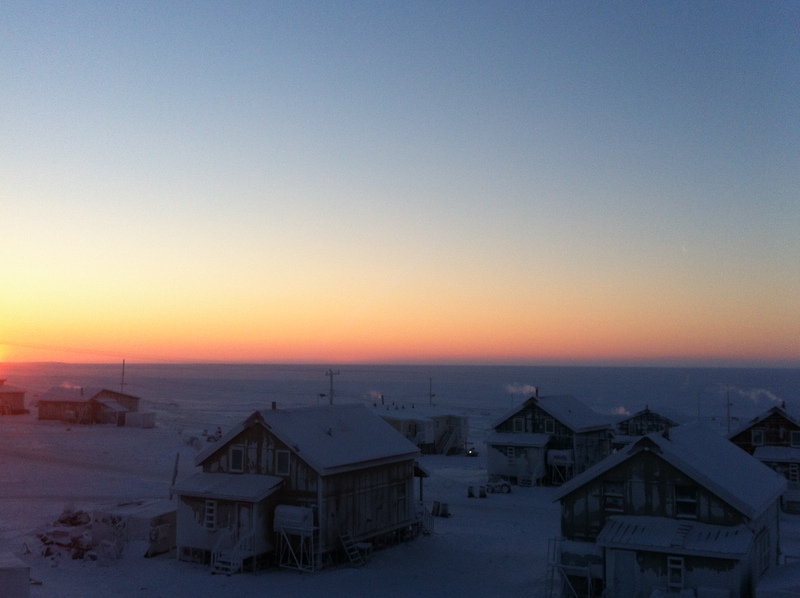 As someone who has only spent a few days in this village, I feel unqualified to comment much upon the local Inuit culture. It does seem however, that most of the traditions are no longer practiced. For instance, the elders often speak only Inuktitut, but most of the people younger than me cannot. 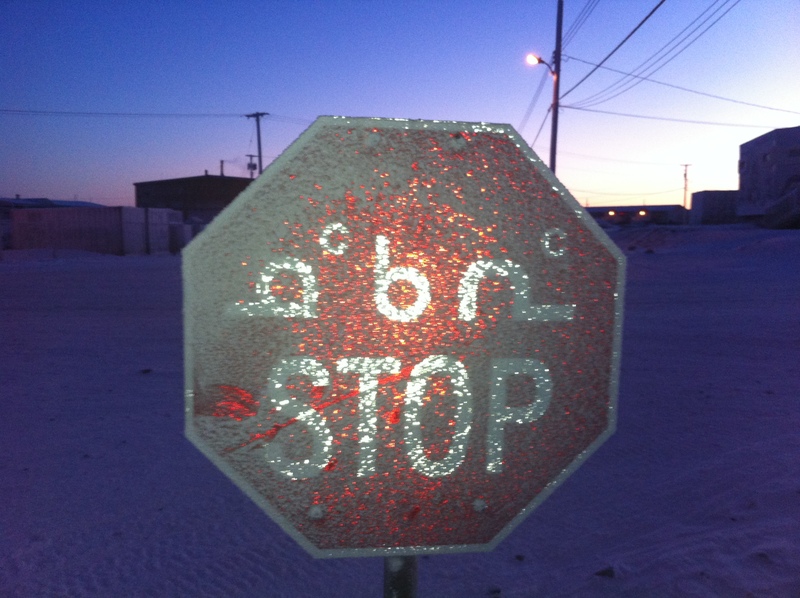 Inukitut seems to be a very complex language to learn – full of unusual consonants like q. As well, apparently each work captures an entire thought or concept. 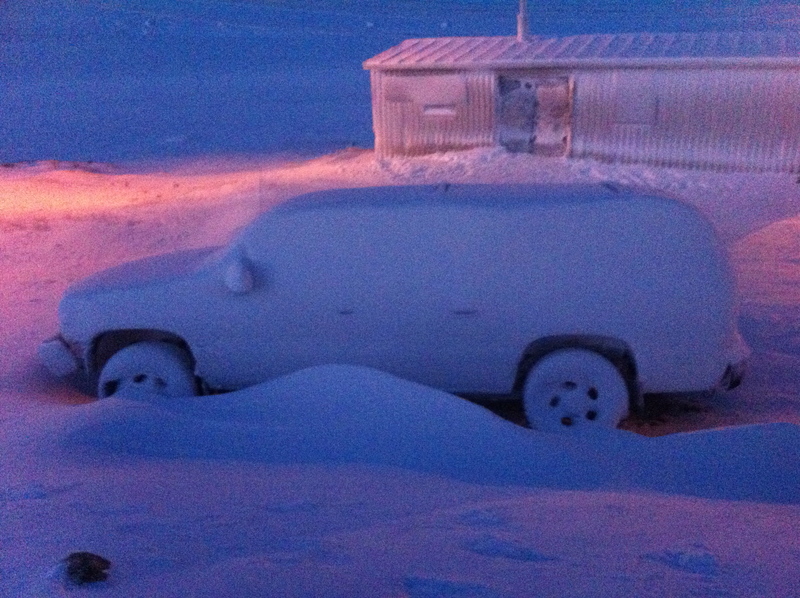 For instance, my Inukitut phrase book tells me ‘I have cancer’ translates as ‘Aqirktauyungnangituqarqtunga’. And ‘It might snow’ is ‘Qarnirqniarqtuksauyurq’. Imagine trying to learn this language! I love the way it sounds though. I can say some of the Inuit names; full of multiple syllables, q’s and a’s, they roll off the tongue musically. The traditional activities that do remain are carving, and textiles. 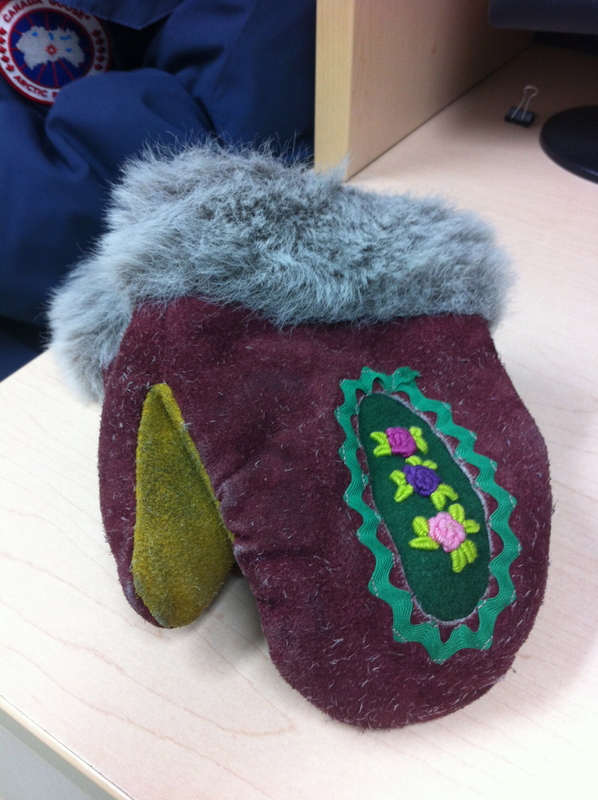 Lots of folks still wear kamiks, traditional style sealskin boots, and fur mitts are also common. There is often an element of embroidery on these items, usually a floral design in bright colors. And it seems that the older women still make lots of parkas. I saw many beautiful and one of a kind parkas worn by women and children, often with big, lush fur collars and trim. 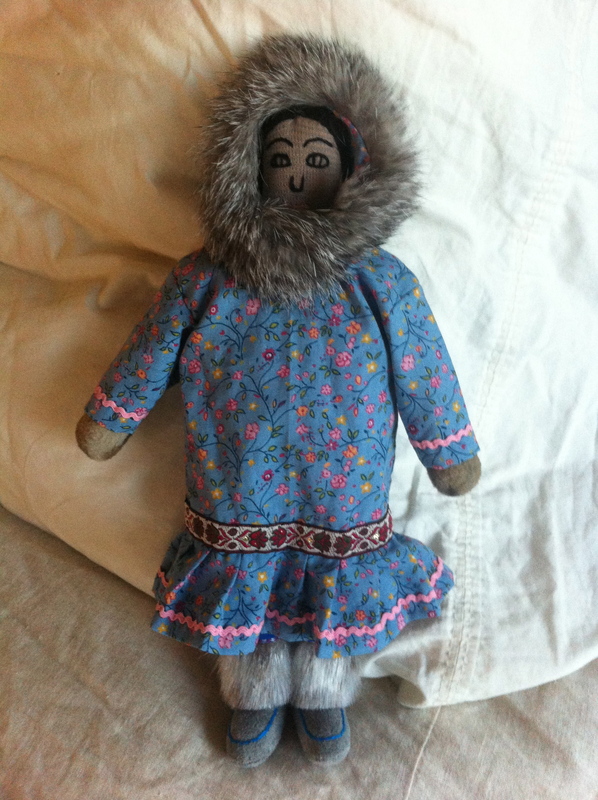 This handmade doll has traditional Inuit clothing. 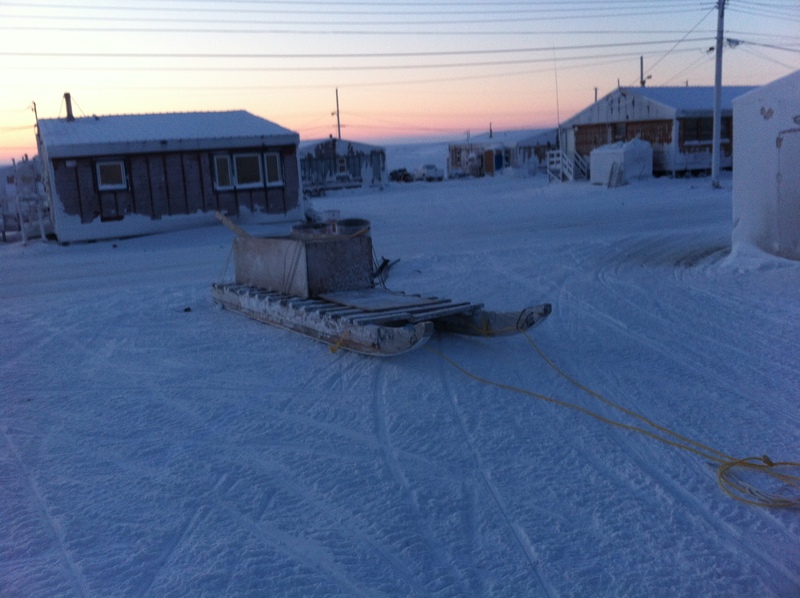 These kamiks are beautiful living artworks, made of sealskin. Practical and very warm. 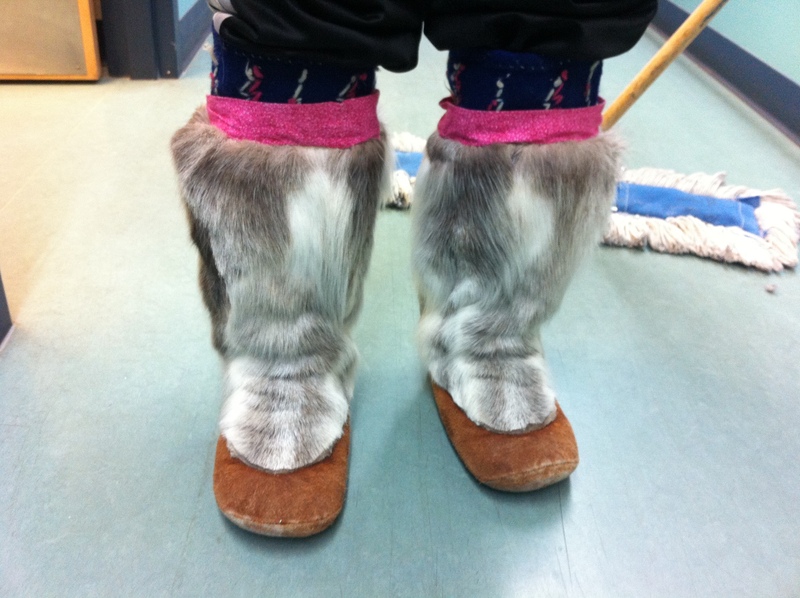 More everyday style kamiks, made of caribou skin. Unfortunately I don’t have any parka photos to show you. I think its unfair to ask patients to pose for photos, and I’m too shy to ask anyone I haven’t met to. I’ve got lots of photos of carvings though, which I will post soon! 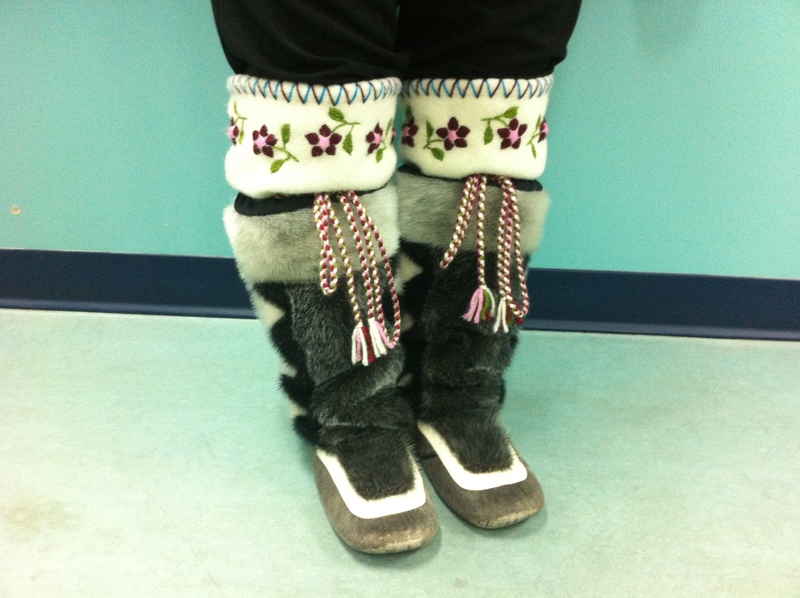 This entry was posted in North of 60 and tagged Arctic, caribou skin boots, Gjoa Haven, Inuit culture, Inukitut, sealskin boots. Bookmark the permalink. thanks for these wonderful fragments of this far away world – I once went to Tromso in the north of Norway in the middle of December, we saw no sunlight at all all week, I couldn’t have lasted any longer up there! I love the sound of the wind, and the bits of embroidery on the mittens. As for the dark – I do fairly well with the long nights of winter, but “long” has never come close to the nearly permanent that you experienced! I went over to YouTube and found this example of the language – a public health notice about immunizations. It sounds like its words look – uninflected, long curls of language. My current post contains some photos and information about a project called 100×100. A German photographer named Michael Wolf went to Hong Kong and recorded the lives of 100 people or families living in 100 square foot rooms in a housing project. It’s very interesting that you mentioned seven people in 800 square feet, and an Italian family I wrote about lived in 375 sq feet in a NYC tenement. Surely this all is happenstance, but it’s beginning to seem as though a hundred square feet per person is the going thing in difficult circumstances. Wonderful photos and narrative. I hope all is well in your life, and that your Christmas is a delight! THanks for this example of Inukitut Linda. It never would have occurred to me to find it on the net. I previously lived in a 400 square foot cabin with one other person, and it was absolutely fine. We lived in the wilderness as so the outdoors became a part of our home too. We had everything we needed, and nothing that we didn’t. I think living in a small footprint actually gives us a larger life. CBC’s article on Nunavut’s Inuktitut celebration reminded me I’d neglected to follow through on my intention to comment on this post. In the spirit of better late than never, the two best online Inuktitut resources I’m aware of are http://www.tusaalanga.ca/ and http://www.nnsl.com/ -> Free Features -> PDF Archives. 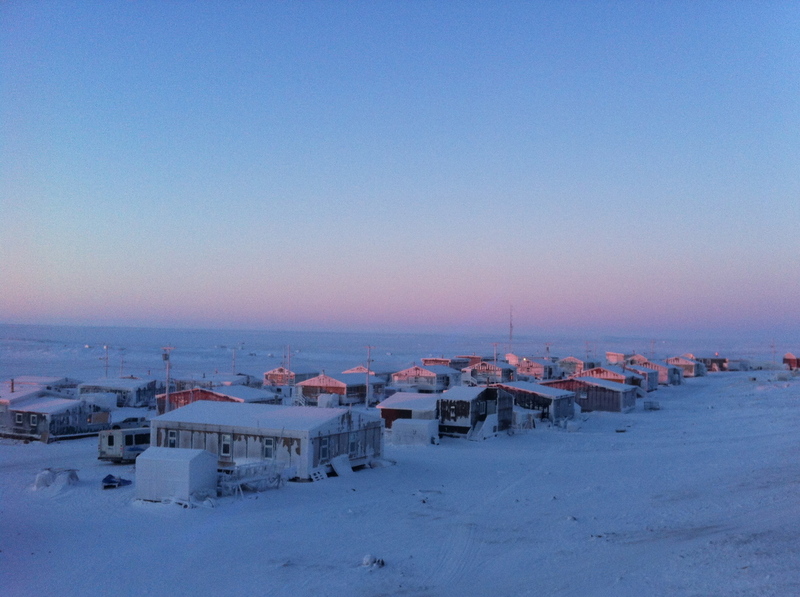 Tusaalanga provides self-paced online instruction and some of the articles in NNSL’s Nunavut editions are written in English and Inuktitut side by side. And thank you another great blog entry!